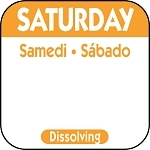 1″ square dissolving food rotation labels dissolve completely in water. These biodegradable labels ensure you’ll never scrape crusty tape or food rotation labels off washed containers again. 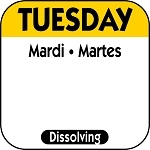 Each label has space to write the use by date with the preprinted day of the week showing the prepped day, or vice versa. Works in temps range: -40°F to 176°F with a minimum application temp of 21°F when adhered above condensation line. Minimum investment with great savings. The average restaurant spends less than $200 annually on DateIt™ food safety and Pegasus Ventures dissolving food rotation labels! Reduce food waste. Using the DateIt™ food safety products to carefully monitoring expiration dates. 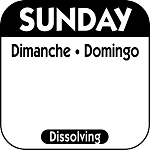 Check the related food rotation labels below to order each day of the week can be found below as well as a dispenser, the LL7R-1 Plastic 1" Day of the Week Label Dispenser- 7 day from DateIt™ Food Safety, that works well with this product! Assure the health inspector that your kitchen operation is safe. Using an organized color coding labeling system from DateIt™ Food Safety and Pegasus Ventures assures your operation is up to date on available food safety solutions. Avoid cross-contamination. 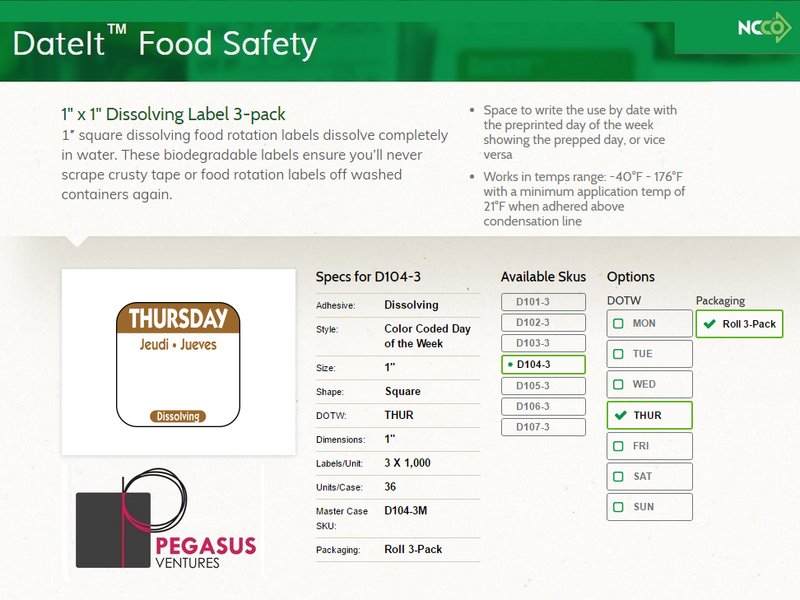 The DateIt™ Food Safety and Pegasus Ventures food labeling system from Pegasus Ventures allows a restaurants several adhesive options that meet the needs of a diverse kitchen environment. Our dissolving labels leave no adhesive residue after washing, so stacking containers is now safe. Avoid serving food that is out of date or no longer fresh. 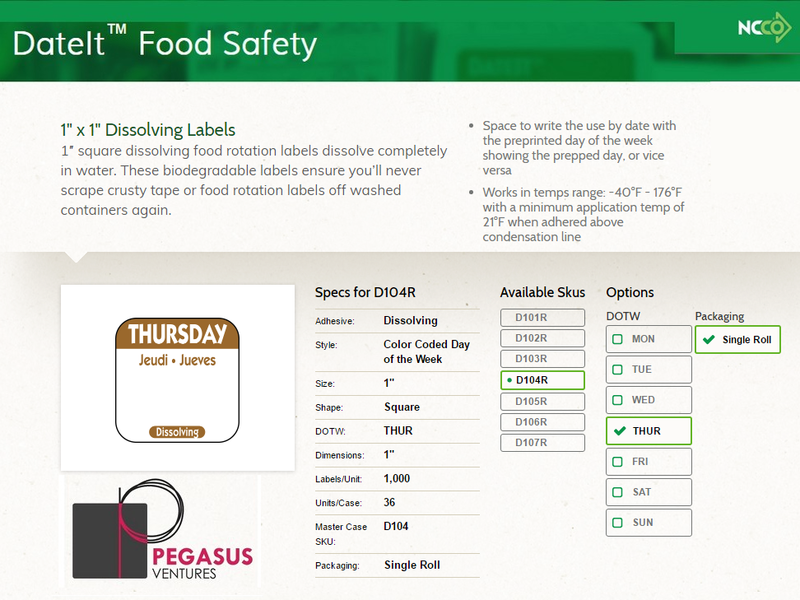 DateIt™ Food Safety and Pegasus Venture's color coded labeling system food labeling system from Pegasus Ventures allows easy identification in refrigeration or freezer environments. Avoid lawsuits. When used properly, DateIt™ Food Safety from Pegasus Venture's food safety labeling systems creates an organized and safe solution in managing food freshness. Conveniently available. DateIt™ Food Safety from Pegasus Ventures food safety labeling solutions are always in stock and ready to ship to your restaurant or commercial kitchen. Reduce food waste. 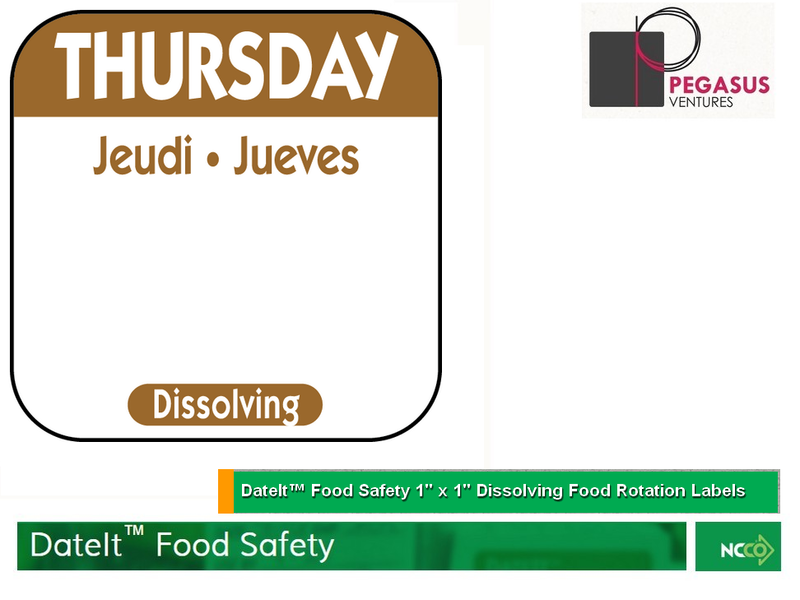 Using the DateIt™ Food Safety from Pegasus Ventures labeling system helps avoid food waste by carefully monitoring expiration dates.